We hope you’ll join us for a special presentation of the “Laguna Foundation Watershed Hero Award” to Vic and Karen Trione. The Laguna Foundation Watershed Hero Award recognizes extraordinary vision, dedication, commitment to the protection, improvement, and conservation of the Laguna de Santa Rosa Watershed for the people, wildlife and communities that depend on it. 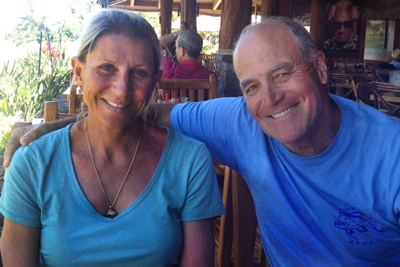 We salute Vic and Karen Trione for their continuous support of the Laguna Foundation’s restoration and education programs to create a healthy ecosystem for future generations. Save the Date! Sunday, June 9, 2019, 2 P.M. Celebrate what’s wild in the Laguna with a visit to our new native plant nursery, get up close with a wildcat ambassador, hop on a hayride to one of our largest conservation sites, and spend time with one of the best conservation grazers – Picasso the Goat! We’ll provide a feast of local foods, wine and brews. We hope you’ll join us! This is the Foundation’s most important fundraiser and vital to the success of our mission to restore the Laguna. Funds from this event support our programs to make the Laguna a sustainable ecosystem for future generations – one with clean water, healthy soil, restored plant and wildlife habitat and active, inspired children. Complimentary tickets to this exciting event! Click here for more information on our available sponsorship levels and to download the sponsorship form. If you have any questions, please contact Bev Scottland by email or by calling (707) 527-9277 xt. 106.